If you’re reading this and will be traveling for vacation or work, you’ll probably want to take some cigars, especially since traveling may mean a lack of access to cigars (or a lack of access to the authentic cigars you want to smoke). And even if you think you’ll pick up some cigars on your trip, bringing a few along for the ride is probably a good idea. 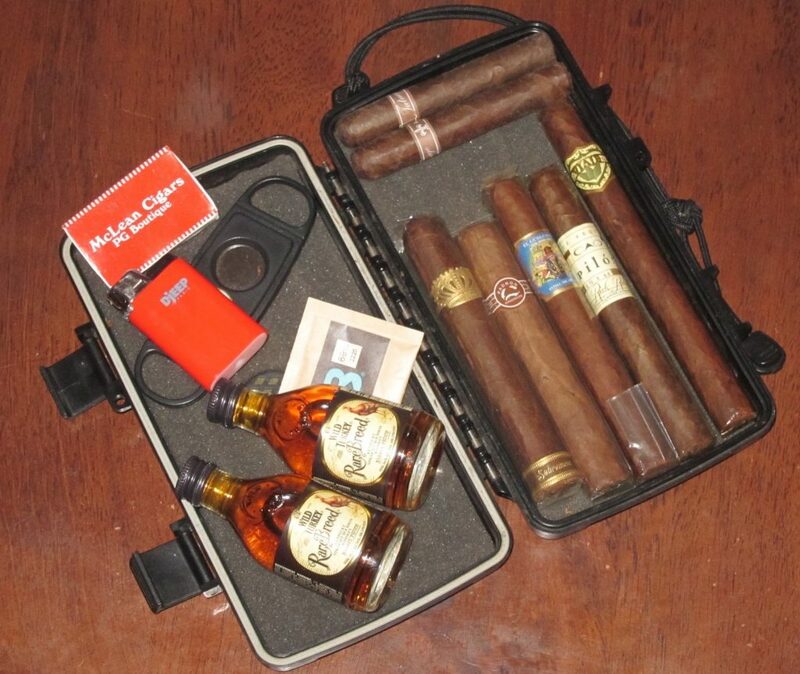 So here are some tips to make your air travel with cigars smoother. Plane travel can be a traumatic experience for cigars, between the pressurized air and the fact that your bag is probably going to be forcibly jammed in the overhead bin or under the seat in front of you. (Don’t check your cigars, as the cargo hold of the plane can have some pretty extreme temperature changes that can do serious damage.) The natural solution is a hard plastic cigar case like those made by Xikar or Cigar Caddy. Each comes in anywhere from a five to fifteen-count, or sometimes more. If you don’t have a case, or if you can’t fit all the cigars you want to bring in the case you have, a sealed Ziplock bag will do fine. But you’ll want to put the bag in a hard tube or box to make sure they don’t get crushed. If you are traveling for more than few days, throw a small Boveda pack in with your cigars to help stabilize and maintain proper humidity. My go-to soft flame lighter is the Djeep, which is dependable and has decent capacity. It’s also cheap, so if some ornery TSA agent on a power-trip takes it you won’t be too upset. (Every year or two I buy a 24-pack.) If you really want a torch lighter, you might consider a Soto Pocket Torch, which can convert a regular cheap lighter into a torch. But bring the lighter in your carry-on and leave the Soto in your checked bag to make sure it isn’t confiscated. Also, for all lighters and matches, know that other countries might have different rules. (Nicaragua, of all places, is known for taking all lighters when you depart from Managua. On the other hand, I’ve brought Ronson JetLite torches through U.S. TSA security multiple times.) So no matter what you bring, make sure it is something that, if push comes to shove, you won’t feel too bad about leaving behind. Bringing most cutters on a plane shouldn’t be a problem (according to the TSA, blades smaller than four inches are good to carry on), but you never know how the rules are going to be enforced. So fancy cutters, if you must bring them, should go in checked luggage. Travel is the perfect time to bring along that cheap cutter you got as a throw-in. And remember: If all else fails, you can always cut your cigar with your fingernail; just don’t use your teeth. Traveling overseas means you’ll probably have access to cigars from that island south of Miami, but don’t assume you’ll easily be able to find legitimate Cuban cigars. For years, Americans have been buying and smoking Cubans overseas, even though this practice violated the Cuban embargo. Now, with restrictions being eased, it is perfectly legal for an American to smoke a Cuban cigar while abroad. Unless you are heading to a country that doesn’t allow alcohol (like Saudi Arabia or Iran), there is nothing wrong with putting a bottle or three in your checked bag. But what is often overlooked is that you can actually carry on booze in small amounts. When carrying on, alcohol is subject to the same rules as other liquids, meaning no container more than 3.4 ounces and all liquids must fit in a one-quart sized bag. Mini bottles (usually 50 ml.) are well under that limit, and you can fit five or six in one Ziplock. (You can even fill your own 2 oz. sample bottles if you want to bring something special.) If you are planning on cracking these open on the plane, know that most airlines have a rule against alcohol not served by the flight attendants. 1. Arnold Schwarzenegger. Whether you’re going as The Governator or one of his gun-toting movie characters, a big cigar won’t look out of place. 2. Groucho Marx. Sure, it’s a little dated, but this American icon loved his stogies. 3. Mark Twain. America’s cigar-smoking author. 4. Scarface. Say hello to my little friend. 5 Bill Clinton. The president who got into trouble with cigars. 6. Mike Ditka. See photo of Patrick A from (more than) a few years ago. 7. Ernest Hemingway. The famous author loved his cigars. 8. Winston Churchill. Leading (and smoking and drinking) England through World War II, this prime minister is by far the manliest British dude ever. By far. 9. A cigar-chomping communist dictator. Any Pinko Commie like Fidel Castro, Kim Jong Il, or Che Guevara will do. 10. The Babe. Maybe the greatest slugger in baseball history, Babe Ruth was known for his love of food, drink, and cigars. 11. Al Capone. If we’re talking mafia bosses, why not be the original? Capone was known for his enjoyment of cigars, booze, and women. Just don’t get syphilis. Got a few costume ideas that we missed? Let us know in the comments. After smoking several thousand cigars and reviewing hundreds, I have a pretty good idea of what I do and don’t like. That, of course, doesn’t make my opinions any more valid that yours or anyone else. But it does mean I have a lot of experience. And some of what I’ve learned might help you in evaluating cigars you’re trying for the first time. These three tips are among those I consider most important. — Unless you thoroughly dislike a cigar from the get-go, I recommend you hold off on making a determination from a single sample. Most reviewers smoke several cigars, and there’s good reason for that. 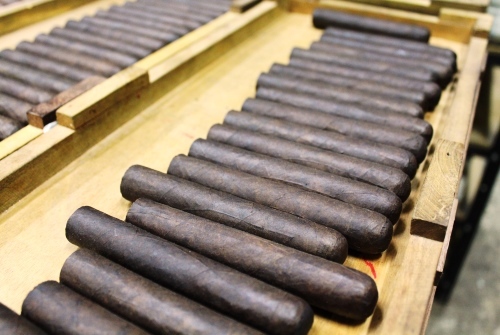 Obviously, premium cigars are a handmade product and, therefore, subject to some differences along the production line. A poor burn, for example, could be because the cigar was too wet or because a leaf was improperly placed in the bunch. There’s another reason that can be even more important. The situation in which you smoke can exert a profound influence on how you feel about the cigar. Lighting up a celebratory stick after getting that promotion you wanted? It’s almost certain to go well. Trying to smoke while being interrupted by phone calls, unexpected diversions, or your neighbor jackhammering his patio will invariably make the experience less than ideal. An easy way to see this is to picture yourself lighting up as you watch your favorite sports team. They’re off to an early lead and play superbly to the end. Good cigar, right? Now, imagine that same cigar as your team is down almost immediately and hammered constantly to the end. Not nearly as enjoyable a smoke, is it? — Beware of confirmation bias, the psychological term for the all-too-human tendency toward wanting something to be true and, therefore, deciding it is without weighing the evidence. With cigars, this occurs most often when one of your favorite manufacturers has a new release. You love their cigars, and you know you’re going to love this one, too. Maybe. But maybe not. The reverse can also happen. You pick up one from a brand you haven’t enjoyed—or maybe have just heard or read negative things about—and you subconsciously conclude beforehand that it isn’t good. — Concentrate, but don’t go overboard. Not only will this help you deal with confirmation bias, it will also put you in a much better position to reach a reasonable conclusion. Getting in the isolation booth and doing nothing but puffing may help you find a somewhat obscure flavor or two, but that isn’t how most of us smoke cigars. I think that approach can actually diminish your evaluation. Smoking cigars should be about pleasure, not subjecting yourself to a tobacco version of the SAT. Enjoy yourself, enjoy your smoke. And when you’re done, hopefully you’ll have a good idea of whether you want to smoke more of those cigars or not. The Fourth of July is a good time for cookouts and fireworks, but also a time to reflect on what Independence Day celebrates. There is, of course, plenty to think about when it comes to the principles of freedom. We’re a cigar website, though, so let’s use the opportunity to look at what each of us can do to protect our cigar freedoms. 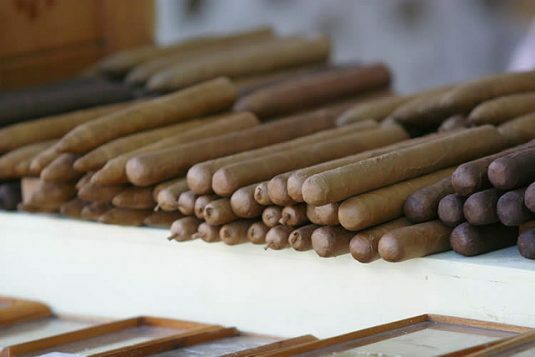 The FDA is currently reconsidering its regulation of cigars. As part of it’s new regulatory approach, the FDA announced earlier this year it was opening up a new comment period. That period ends at the end of July, so you shouldn’t put it off anymore. Cigar trade groups should be preparing to overwhelm the FDA with an abundance of scientific evidence for why it makes no sense for handmade cigars to be regulated the same as cigarettes, especially when the stated goal of the FDA’s tobacco regulation is overall public health and tobacco use by minors. But the volume of comments also helps, and you can be sure the anti-tobacco lobbyists will be trying to drive as many people to leave comments against rolling back cigar regulation. The FDA has limited resources and its regulations should be focused on where it can best achieve overall goals, not occupying considerable resources on handmade cigars. Handmade cigars are an inherently inefficient way to deliver nicotine, which is why those simply looking for nicotine won’t choose cigars over other tobacco products. There is no evidence that youth are drawn to handmade cigars, especially considering the price. Handmade cigars are an artisan, handmade product, which renders any regulation particularly burdensome. Leave you comment here before July 25. Once you’ve left your comment with the FDA, copy it and send it to your senators and congressman. Tell them you just asked the FDA to leave cigars alone, but ultimately the responsibility to fix the current problem lies with Congress. Tell them the issue is important to you and that their stance on it is an important factor in winning your support. Tell them specifically to commit to co-sponsoring the Traditional Cigar Manufacturing and Small Business Jobs Preservation Act. Leave the bill number (H.R. 564 for members of the House, and S. 294 for senators). Cigar Rights of America is the only consumer-oriented group devoted to fighting for cigar rights. The more members they have, the more their voice is paid attention to on Capitol Hill. Joining is just $35 for a year, and you get two limited edition cigars plus other benefits. Or you can buy a CRA Sampler of 10 limited edition cigars for $100, which includes a one-year membership. 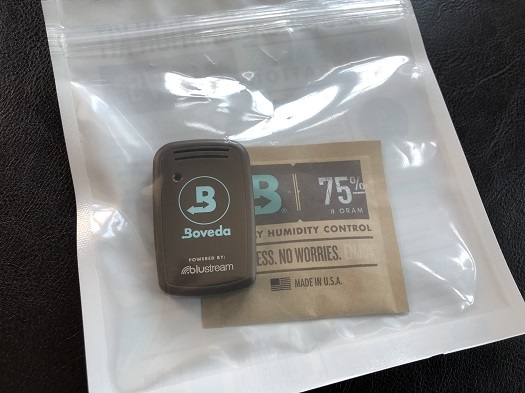 As we recently reported, Boveda, the Minnesota-based “global leader in two-way humidity control,” has introduced what it is calling “the best innovation for premium cigars since the invention of Boveda.” Called the Smart Sensor, the device syncs up your humidor’s humidity and temperature levels with an app on your phone or tablet. The Smart Sensor is currently available at BovedaInc.com. It retails for about $40, or $50 if you also want four large humidification packets and a calibration kit (you probably do). Once the Sensor arrives, getting started is easy. The first thing you’ll want to do is download the free app and link your Sensor (a process that took me no more than a few minutes. Next, you’ll want to calibrate the Sensor by placing it in a Boveda-provided sealed bag with a small Boveda packet. After a two-point calibration is completed, the device will be accurate within +/- 1.5% relative humidity; the accuracy goes down to +/- 2.5% with a one-point calibration. After 24 hours, the Smart Sensor will be ready for use. Simply place it (or mount it) within your humidor. You can now check on your humidor without opening its lid from a range of about 100 feet (or, if you want to extend the reach to anywhere in the world, you can use a second device). 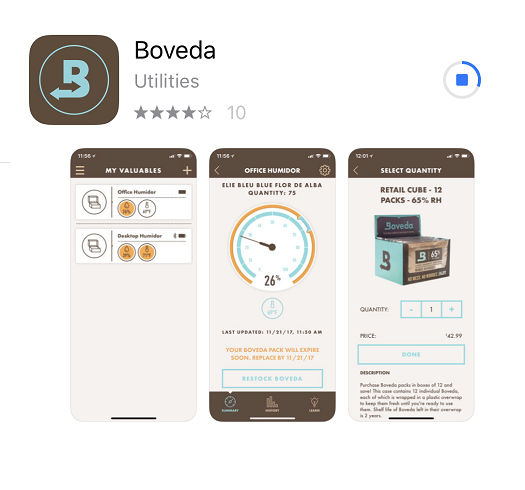 The Boveda Knowledge Base, found within the app, is a nice value-add, featuring FAQs about cigar humidification. The sensor is small and unobtrusive; it will not hamper your cigar storage capacity. Cheers to Boveda for including an idiot-proof user guide and accompanying video; setting up the Smart Sensor could not have been easier. One of my favorite features is that the app can be customized to alert you to humidity or temperature changes exceeding a user-defined threshold of acceptability. 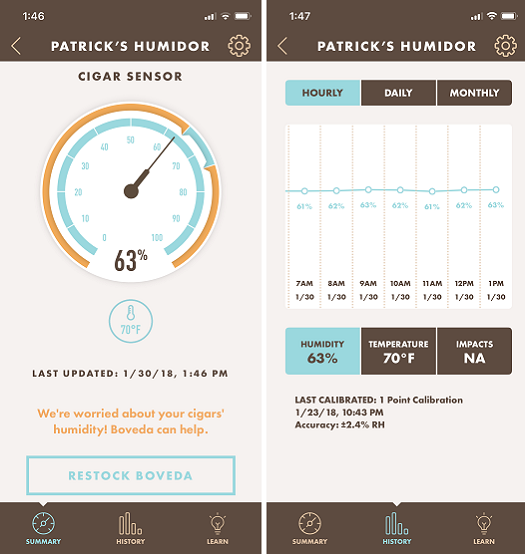 The app also allows to you create a profile for the humidor (or humidors) you’re monitoring, including a name, picture, quantity of cigars, and notes. 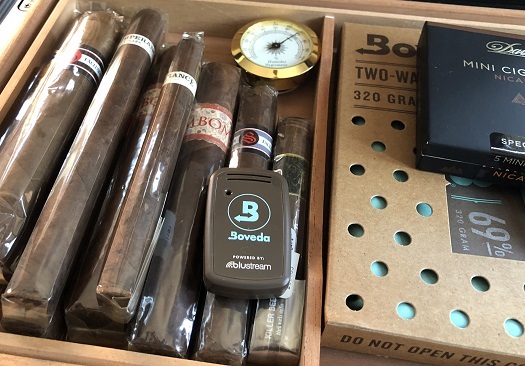 As always, please note that while Boveda provided me with one Smart Sensor (and calibration kit), their generosity in no way impacts my opinion of the product. On its own merits, Smart Sensor is a wonderful device that will be enjoyable and satisfying to thousands of tech-centric cigar enthusiasts. The holidays can be hectic and stressful. But StogieGuys.com is here to help. Over the past decade plus, we’ve written plenty of articles that can help you survive (and thrive) during this time of year. Booze also makes a great gift. Our extensive archive of spirits reviews (all of which also include cigar pairing suggestions) is full of excellent suggestions. 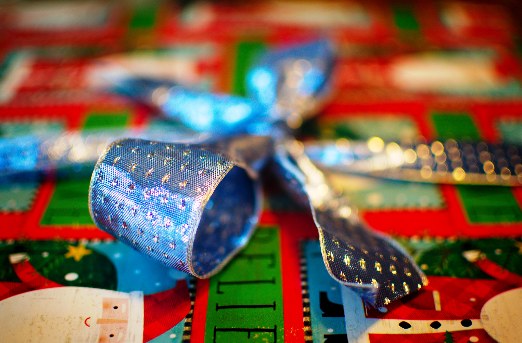 Also, check out our bourbon gift-giving guide and our A-Z Bourbon Guide. Depending on where you are, it can be very cold this time of year, which provides many challenges. Here are some tips for surviving the cold (and here are some additional suggestions). Looking for new cigar suggestions? The end of of the year is a good time to see if there is a cigar you missed from the past year that you should have tried. When you’re celebrating New Year Eve, here’s how to pair champagne with a cigar. And if you’re thinking about which cigar to smoke, consider it might finally be time to light up that special cigar. Finally, looking for resolution for 2018? Take cigar inventory. Maybe watch your cigar budget. Run a marathon, if you want. But whatever you do, don’t quit smoking cigars. Here’s to a safe, cigar-filled holiday season.